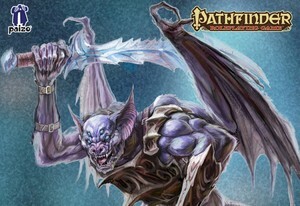 This silent batlike humanoid has a long, ratlike tail and four narrow eyes. Sounds like a friendly character?! Nope! With a poisonous bite, a mindshock attack that will melt your brain and a screech that makes that baby who cried all the way from Sandpoint to Magnimar seem like a lyric baritone this is one creature your players won't forget battling. Especially if you run this SoundSet while the battle is on. Nothing brings home sonic weapon like an actual sonic experience! This SoundSet includes the disturbingly vicious "Grioth Screeches" performed by Robert Frostrazor Brambley at PaizoCon 2015. THANK YOU Frostrazor! Grioth Battle SoundSet © 2014 Paizo Inc. Paizo Inc., the Paizo golem logo, Pathfinder, and Pathfinder Adventure Path are trademarks of Paizo Inc. Sounds created under license with Paizo Inc.